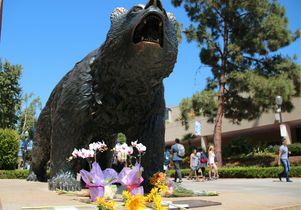 Memorial flowers are gathering at the feet of the Bruin. Two campus vigils are being planned to grieve for all the victims of Wednesday's shooting on campus. 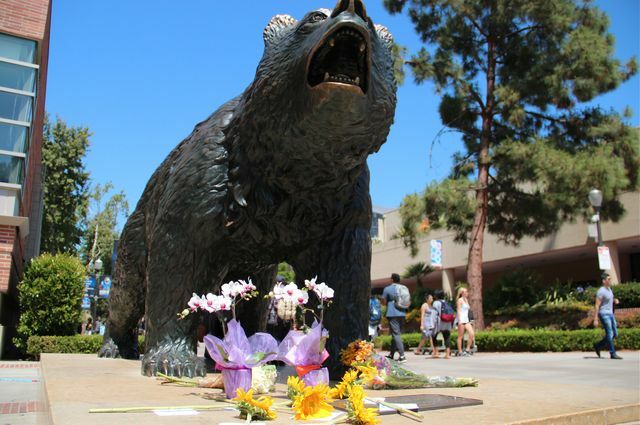 A candlelight vigil will be held tonight on Bruin Plaza at 8:30 p.m. Student organizers of the #BruinStrong Candlelight Vigil are inviting faculty, staff and members of the community to join together in the spirit of solidarity in observance of National Gun Violence Awareness Day. Students will be joined by Los Angeles City Councilman Paul Koretz, interfaith leaders and UCLA administrators. Counseling and support services will be on hand for those in need of care. Find updates on tonight's vigil on the Facebook page. A second vigil will be held 4 p.m. Friday in the Court of Sciences by the UCLA Henry Samueli School of Engineering and Applied Science. It will be open to the UCLA community and the public as well. 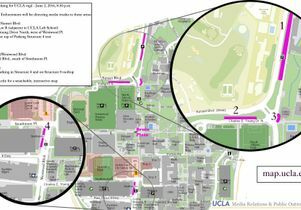 A media truck map for Thursday night's vigil is attached below, click below or click "Related Documents" for a larger PDF version. 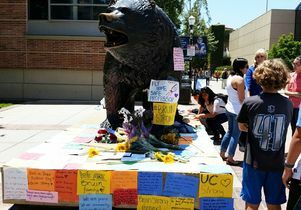 Flowers at Bruin memorializing victims of June 1, 2016 campus shooting. Memorial flowers for Professor William Klug, victim of a campus shooter on June 1, 2016.